Bushra Khalid from Pakistan is an IIASA Postdoctoral Research Scholar in the World Population (POP) and the Evolution and Ecology Program (EEP). Her research interests are climate and health, numerical weather prediction, and climate modeling. Her project will focus on developing a dynamic disease predictive model with the aim of highlighting the disease hotspots and the factors causing them in order to inform end users and policy makers to take mitigation measures in the vulnerable regions. 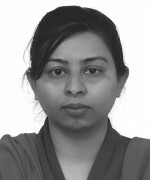 Dr. Khalid finished her PhD in Meteorology from COMSATS Institute of Information Technology, Pakistan, in 2015. She has worked as a Postdoctoral Research Scholar at the University of the Chinese Academy of Sciences (UCAS), China, researching the impacts of climate change on health. She is a junior associate at The Abdus Salam International Centre for Theoretical Physics, Italy. Dr. Khalid was the recipient of the ‘Gro Brundtland Award’ for professional performance in sustainable development & public health among young female scientists in 2016.